"Meet Elsie MacGill — the world’s first female aeronautical engineer! 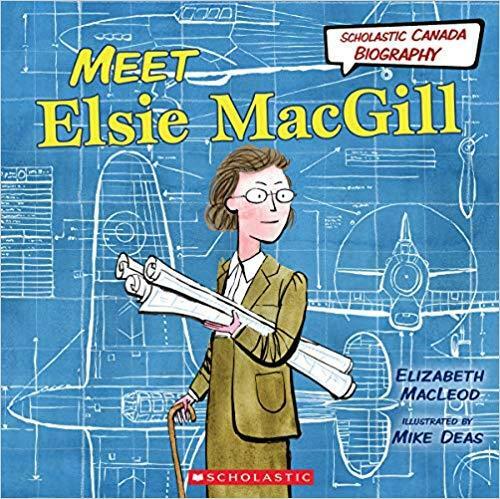 In this amazing addition to the Scholastic Canada Biography series, young Canadians will learn about the trailblazing Elsie MacGill, whose work on the Canadian-made Hawker Hurricane fighter helped the Allied forces to victory in World War II. Elsie was born in 1905 to a mother who was a feminist pioneer in her own right. Elsie grew up fully expecting to follow her dreams. And she did. Elsie was first woman to graduate from the University of Toronto’s electrical engineering program. Elsie went on to earn a master’s in aeronautical engineering —but contracted polio the day before her convocation. She battled back, and a storied engineering career followed, including being in charge of the tooling and manufacture of the famous Hawker Hurricane. Later in her life she was a champion of women’s rights and her work shaped many of the protections we now enjoy. Written by award-winning author Elizabeth MacLeod, this portrait of Elsie MacGill is the first ever written for younger readers. The simple text and full-colour, comic-flavoured illustrations by Mike Deas bring this fascinating story to life!"